The first China International Import Expo will be held in Shanghai from November 5 to 10. At the invitation of President Xi Jinping, the following leaders will attend the Expo: President of the Czech Republic Miloš Zeman, Chairman of the Council of State and the Council of Ministers of Cuba Miguel Díaz-Canel, President of the Dominican Republic Danilo Medina, President of Kenya Uhuru Kenyatta, President of Lithuania Dalia Grybauskaitė, President of Panama Juan Carlos Varela, President of El Salvador Salvador Sánchez Cerén, President of the Swiss Confederation Alain Berset, Prime Minister of the Cook Islands Henry Puna, Prime Minister of Croatia Andrej Plenković, Prime Minister of Egypt Mostafa Madbouly, Prime Minister of Hungary Viktor Orbán, Prime Minister of Georgia Mamuka Bakhtadze, Prime Minister of the Laos Thongloun Sisoulith, Prime Minister of Malta Joseph Muscat, Prime Minister of Pakistan Imran Khan, Prime Minister of Russia Dmitri Medvedev, and Prime Minister of Vietnam Nguyễn Xuân Phúc. At the invitation of President Xi Jinping, President Salvador Sánchez Cerén of the Republic of El Salvador, President Danilo Medina of the Dominican Republic, President Miguel Díaz-Canel Bermúdez of the Council of State and the Council of Ministers of the Republic of Cuba will pay state visits to China from October 31 to November 8. 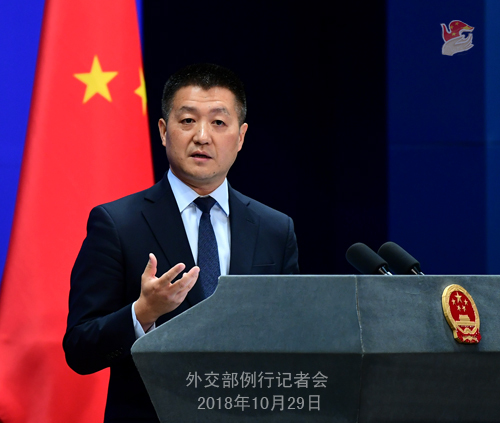 At the invitation of Premier Li Keqiang, Prime Minister Imran Khan of the Islamic Republic of Pakistan and Prime Minister Dmitry Anatolevich Medvedev of the government of the Russian Federation will pay official visits to China from November 2 to 7. During the visit, Premier Li Keqiang will hold the 23rd regular meeting between Chinese and Russian prime ministers with Prime Minister Dmitry Medvedev. At the invitation of Guo Shengkun, Co-Chair of the Chinese party of the China-Belarus Intergovernmental Cooperation Committee, Member of the Political Bureau of the CPC Central Committee, Member of the CPC Central Committee Secretariat, and Secretary of the Political and Legal Affairs Committee under the CPC Central Committee, Nikolai Snopkov, Co-Chair of the Russian party of the China-Belarus Intergovernmental Cooperation Committee and Deputy Head of the Belarus President Administration will come to China on November 2 to co-host the 3rd Meeting of the China-Russia Intergovernmental Cooperation Committee. Q: On October 28, Brazil held a second-round vote of the presidential election. According to information coming out this morning, the Social Liberal Party candidate Jair Bolsonaro was elected as the new president. What is China's comment? A: China expresses congratulations to the smooth and successful running of the general election in Brazil and to Mr. Jair Bolsonaro on his election as Brazilian President. We hope that Brazil will continue to score new achievements in its national development. China and Brazil are both major developing countries and important emerging markets as well as comprehensive strategic partners. In recent years, China-Brazil relations have developed rapidly in an all-round manner as evidenced by fruitful outcomes in practical cooperation across the board. Developing China-Brazil relations has become the widespread consensus of people in all sectors in our two countries. China always attaches importance to the development of China-Brazil relations from a long-term strategic perspective. We stand ready to maintain and ensure the sound growth of our comprehensive strategic partnership with Brazil in an effort to bring more benefits to the two countries and peoples and make due contributions to upholding the common interests of developing countries and safeguarding peace and stability in the region and beyond. Q: The UN General Assembly will vote on October 31 on Cuba's draft resolution to end economic sanctions unilaterally imposed by the US government. What is China's position on this? A: China always maintains that the international community should respect all countries' rights to independently choose their social systems and development paths and oppose unilateral sanctions by military, political, economic or other means. China firmly supports the Cuban people in upholding their rights to existence and development. Thus, for 26 years in a row, China has voted in support of passing resolutions at the General Assembly to end the economic, trade and financial blockades imposed by the US on Cuba. Meanwhile, China hopes that Cuba and the US could continue with the process to normalize their relations, as this serves the common interests of the two peoples and contributes to peace and stability of the region and the whole world. Q: Japanese Prime Minister Shinzo Abe has wrapped up his visit to China. In his talks with President Xi Jinping and Premier Li Keqiang, he proposed the three principles for China-Japan relations, namely, "switching from competition to collaboration", "becoming partners instead of threats to each other" and "promoting free and fair trade". Has the Chinese side confirmed these three principles to the Japanese side and what's your comment on Prime Minister Shinzo Abe's visit? A: With the concerted efforts of the two sides, Prime Minister Shinzo Abe's visit was very successful. In his talks and meetings with Chinese leadership, Prime Minister Shinzo Abe said he hopes to take the opportunity of this visit to open up a new era for China-Japan relations featuring a switch from competition to collaboration. He added that as important neighbors, China and Japan are strategic partners rather than threats for each other. China's development presents an important opportunity for Japan. The two sides should work together to promote the free and fair international economic order and make contributions to free trade and world economic development. The Chinese side welcomes Prime Minister Shinzo Abe's above-mentioned remarks and hopes that the Japanese side will translate these positive remarks into actions and engage in more positive interactions with the Chinese side to promote new progress after China-Japan relations come back to the right track. Q: About 1,500 Chinese tourists were stranded in Saipan due to Typhoon Yutu. The Chinese Consulate General in Los Angeles released a notice on October 26 that relevant Chinese airliners have arranged planes bound for Saipan on October 28 to carry home stranded Chinese tourists. Do you have more information on that? What has China done to help these stranded Chinese tourists? A: On the afternoon of October 24 local time, Super Typhoon Yutu carved through Tinian and Saipan of the US Northern Mariana Islands. According to the Chinese Consulate General in Los Angeles, about 1,500 Chinese tourists were stranded on the islands due to the closure of the local airport. 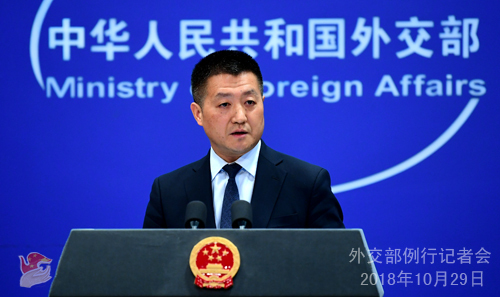 The Foreign Ministry attaches high importance to this case, and has been working with the Ministry of Culture and Tourism and the Civil Aviation Administration to help the stranded Chinese tourists get back home in coordination with relevant airlines, travel agencies and tourism e-commerce platforms. The Chinese Consulate General has been in close communication with the relevant US departments to gather timely information on the reopening and timetable of the airport, coordinate their efforts in making proper arrangements for the stranded Chinese tourists and properly handling the issue of visa expiration for some Chinese citizens, and ensure a safe and orderly exit of Chinese tourists. The Foreign Ministry's 12308 hot-line and the ad hoc emergency line set up by the Chinese Consulate General in Los Angeles can be reached around the clock if there is need for advice and help. The working group of the Consulate General has started their work in Saipan. According to what we have on hand, the Saipan International Airport reopened yesterday with limited service to civil airliners. The relevant Chinese airliners managed to send three flights that carried home 713 stranded Chinese tourists. Some Chinese tourists chose to leave aboard foreign airliners. More flights will be sent to carry home the remaining Chinese tourists by the Chinese airliners. Our advice for the Chinese tourists who are still in Saipan is to keep following flight notices and purchase tickets and reschedule timely. We hope to see them back home safe and sound at an early date. Q: The Indonesian Lion Air Flight JT 610 with 189 people onboard has crashed after losing contact. Were there Chinese passengers onboard? What is your comment? What has China done so far? A: We have noted relevant information. We express our deep condolences to the victims and sincere sympathy to their families. The Chinese side immediately contacted relevant parties for verifications after learning this incident. According to what we've got so far, there were no Chinese citizens on board. We will continue to follow the development of the search and rescue work. If anything comes up that involves Chinese citizens, we will let you know and coordinate with relevant work. Q: The President in Sri Lanka has fired the Prime Minister and replace him with the former President Rajapaksa. The Parliament now has been suspended. There have been some shots fired and people have been injured because of the protests. China and Sri Lanka have a very close relationship. There is a lot of Chinese investment in Sri Lanka. What is China's opinion on what is going on in Sri Lanka at the moment? A: As a friendly neighbor to Sri Lanka, China has been closely following the situation in Sri Lanka. We follow the principle of non-interference in other countries' domestic affairs. What is going on in Sri Lanka is their domestic affairs. We believe that the Sri Lankan government, parties and people have the wits and ways needed to deal with the current situation. China sincerely hopes that all relevant parties in Sri Lanka could resolve their differences through dialogue and consultation and maintain their nation's stability and development. Q: You have announced Prime Minister Imran Khan's visit to China. Do you have some specific information to share with us about his meeting with the Chinese leadership and the signing of agreements and other activities? A: This will be Prime Minister Imran Khan's first official visit to China since assuming office which presents important opportunities for the leaders of the two sides to chart the course for the future development of China-Pakistan relations under the new circumstances. During his visit, President Xi Jinping, Premier Li Keqiang and other Chinese leaders will meet and hold talks with him. The two sides will have an in-depth exchange of views on bilateral relations and issues of mutual interest. Like I just said, besides Beijing, Prime Minister Imran Khan will also attend the first China International Import Expo in Shanghai. I would like to stress again that China and Pakistan are all-weather strategic partners for cooperation. Our friendship goes back so long and our political mutual trust enjoys such a solid foundation that China-Pakistan relations are immune to the changing international and domestic landscapes. Recent years have seen frequent high-level exchanges, rapid growth of practical cooperation in various fields, especially the building of the CPEC which has yielded fruitful outcomes, and the ever-strengthening of bilateral friendly ties. This July, Pakistan held a successful election and realized a steady transition of its government. The new Pakistani government has reiterated for many times that it is committed to developing its friendship with China and looks forward to deepening bilateral cooperation. China hopes that through Prime Minister Imran Khan's visit, the two sides could comprehensively align development strategies, continuously deepen all-around cooperation, and elevate bilateral relations to a new height. Q: Regarding the three principles guiding China-Japan relations proposed by Prime Minister Shinzo Abe, you just said that China welcomes that. Does that mean China has agreed to accept the three principles? A: As to Prime Minister Shinzo Abe's visit, I would advise you to give a thorough reading of the readouts of Prime Minister Shinzo Abe's meetings and talks with President Xi Jinping, Premier Li Keqiang and Chairman of the NPC Standing Committee Li Zhanshu. It has been made clear in those readouts that the Chinese and Japanese sides have reached a high degree of consensus on planning for and further deepening China-Japan relations. The two sides confirmed that we will abide by all principles embedded in the four China-Japan political documents, properly handle the issue of history and the Taiwan issue, and maintain the political foundation of our bilateral relations. We will take concrete actions to implement the political consensus of being cooperative partners rather than threats to each other and supporting each other's peaceful development, and manage differences in a constructive manner. In the spirit of taking history as a mirror and facing forward to the future, we will promote new progress after the bilateral relations return to the right track. The two sides also agreed to strengthen high-level guidance for China-Japan relations and conduct practical cooperation at a higher level, promote cooperation in such areas as scientific and technological innovation, energy conservation and environmental protection, health care and old-age care, fiscal and financial sectors, and step up people-to-people exchanges. Under the current international circumstances, we will jointly uphold free trade, oppose protectionism and promote the economic integration of the Asia-Pacific region through concrete actions. Q: The 6th meeting of the Standing Committee of the National People's Congress deliberated and approved the Law on International Criminal Judicial Assistance and default judgment provisions. How significant is this to international anti-corruption efforts for fugitive repatriation and asset recovery? A: The introduction of the Law on International Criminal Judicial Assistance and default judgment provisions once again sends out a powerful signal that all fugitives must be hunted down and held accountable, which demonstrates the central government's consistent stance and unequivocal attitude in making unwavering and relentless efforts to pursue fugitives and recover criminal proceeds. It also shows that the central government is determined in deepening international cooperation and maintaining high pressure campaign so that corrupt criminals will be denied all "safe heavens". Since the 18th CPC National Congress, with the coordination of the Central Anti-Corruption Coordination Group, relevant central government departments have firmly and vigorously implemented President Xi Jinping's instructions on improving legal systems in support of fugitive repatriation and asset recovery and modernizing China's system and capacity for governance. The promulgation of the above-mentioned law and provisions will enhance China's international anti-corruption cooperation and the rule of law in fugitive repatriation and asset recovery, provides a powerful weapon to fight against corrupt suspects overseas in accordance with the law, and ramp up efforts for international anti-corruption cooperation to go after fugitives and bring back stolen assets. Q: It is reported that Russian Foreign Minister Sergei Lavrov said that if the United States pulls out of the Intermediate-Range Nuclear Forces Treaty (INF), Russia will seek to conclude a new treaty based on multilateral negotiations. Will China participate in the negotiations? A: I have not seen those remarks as you said by the Russian side. According to the information I have at present, Russia has clearly expressed its firm opposition to the announcement by the US to start the process of withdrawing from the INF, saying that the US withdrawal is not conducive to maintaining global strategic stability and hoping that the US will think twice before making that move. Q: Last Friday, US National Security Adviser John Bolton said that Washington wanted to hold strategic talks with Russia about China's growing missile capabilities and that those capabilities pose a threat to Russia. What is your comment? A: You may have noticed that after US National Security Adviser John Bolton made the above statement, there are reports that the Russian side has made it clear that the threat to Russia has never come from China but from the United States. So, I believe there is no need for me to comment on that. Don't you think so? Q: You just gave us a list of leaders that will come to China for the first China International Import Expo. Can you tell us why China decided to invite these countries specifically to attend the import fair? 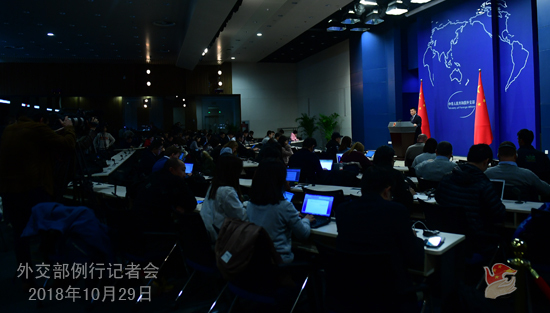 A: Regarding your question, China International Trade Representative and Vice Commerce Minister Fu Ziying gave a detailed introduction on the Expo to the domestic and foreign media at the Commerce Ministry's press briefing this morning. Government officials and business leaders from more than 150 countries and regions as well as representatives of relevant international organizations are invited to attend the Expo. As for the question of which country decides to attend it at what level, it is determined in accordance with the specific situation through friendly bilateral consultations. The first China International Import Expo has received great attention and welcome worldwide. Its scale is also unprecedented. It is a first in the history of international economy and trade to hold an expo for import. This fully demonstrates the sincerity, goodwill and confidence of the Chinese government in further opening up, sharing development dividends with the rest of the world, and realizing mutually beneficial and win-win results. The first China International Import Expo is a piece of good news for the business communities and consumers of all countries. No wonder that they all want to take a seat in the Expo. Q: The US has asked other countries to stop importing crude oil from Iran starting from November 4, otherwise there will be unilateral sanctions. How will China cope with that? Will China continue to import crude oil from Iran? A: China always opposes unilateral sanctions and long-arm jurisdiction. This position is clear and consistent. 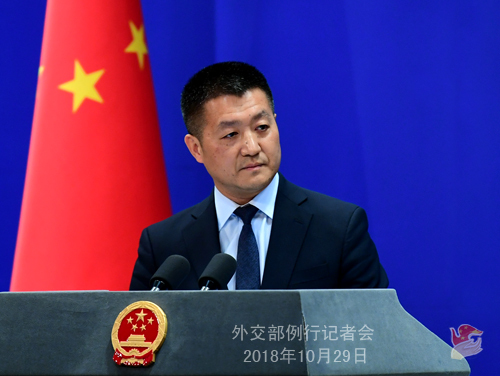 I want to reiterate that the normal cooperation between China and Iran under the framework of international law is reasonable, legitimate and lawful and should be respected and upheld. Q: Regarding the visit of President Miguel Díaz-Canel Bermúdez of the Council of State and the Council of Ministers of Cuba, do you have more details? A: Cuba is the first country in Latin America and the Caribbean to establish diplomatic relations with the New China. China welcomes Comrade Díaz-Canel Bermúdez's first state visit to China after he became President of the Council of State and the Council of Ministers of Cuba. President Xi Jinping will hold talks with President Miguel Díaz-Canel Bermúdez, and other Chinese leaders will meet with him separately. In addition, President Miguel Díaz-Canel Bermúdez will also attend the first China International Import Expo in Shanghai. We believe that this visit will further promote the in-depth development of China-Cuban friendly relations. We will release detailed information on those meetings, talks and the visit in a timely manner. Q: Further to what you said about the situation in Sri Lanka, reports said that the Chinese Ambassador has called on both Mr. Rajapaksa and Mr. Wickramasinghe. Can you please confirm that? A: As a friendly neighbor to Sri Lanka, China has been closely following the situation in Sri Lanka. We follow the principle of non-interference in other countries' domestic affairs. We believe that the Sri Lankan government, parties and people have the wits and ways needed to deal with the domestic situation. As for the specific issue you raised, China keeps friendly exchanges with all parties in Sri Lanka. On October 27, the Chinese Ambassador to Sri Lanka paid visits to Mr. Rajapaksa and Mr. Wickramasinghe during which views were exchanged on the current situation in Sri Lanka and China-Sri Lanka relations.